I've written previously about how much I enjoy South Park. I can certainly understand why some people hate it. We all have different preferences, and that may explain some of it. Then again, I suspect that at least some of those who hate South Park and are very public about their hate for the show might have difficulty laughing at themselves. What I like most about South Park is the irreverence. Nothing is sacred, and they make fun of everyone. This is why the show works so well. We all get our turn at being their targets, and that is how it should be. 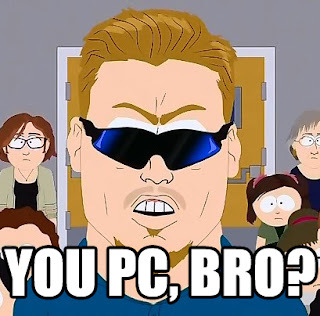 In one recent episode, South Park made fun of political correctness and the social justice warrior mentality. In the very next episode, they relentlessly mocked future U.S. president Donald Trump, a figure who is widely considered one of the most high-profile opponents of political correctness today. South Park has poked fun at virtually every religion, and they've mocked atheists. They've made fun of people who drive Hummers, and they've mocked people who drive hybrids. It is difficult to think of a group of people that hasn't been ridiculed at some point on the show. I cannot pretend to get every episode of South Park. I do my best to steer clear of much of what counts as popular culture in the U.S. When South Park mocks one of the celebrities who seem to be famous only for being famous, a recent movie, or a reality TV show, I usually struggle to get the joke. I've rarely seen the movie, heard of the TV show, or have any idea who the celebrity is. These are the episodes that someone will have to explain to me later, and I may still not get it (e.g., anything having to do with Kanye West). But that's okay because it is rarely difficult to find someone who can let me in on the joke. It seems to me that the more serious and self-righteous one is about one's ideology, cause, agenda, or whatever else, the more desperately one needs to be mocked. I think it is healthy to laugh at ourselves and to point out the absurdity that surrounds us. And from what I can tell, the creators of South Park seem to agree. The two-part episode featuring Richard Dawkins where they mocked atheism was among my favorites at the time. I suppose I could have decided to be offended by it and taken a "how dare they mock atheists" stance, but that would have been ridiculous. It was funny, after all. I hope South Park continues to push the limits of free expression for some time. We need the irreverent attitude. And as long as we continue to behave as we do, we certainly need to be mocked.